There is a "cousin" project by Hankmorgan that may catch Your attention. Congrats to Hankmorgan and good luck! Thanks for the headups, this game was a blueprint for all the 3d 1st person RPGs to come ever since including TES. It had everything right from the get go. Mindbogling game. Nice! AFAIK there've been several attempts to make an Ultima Underworld engine recreation before (some also aimed to have System Shock compatibility), with the most complete known to me being Underworld Adventures, but it hasn't been updated since over ten years ago. I can't tell from the video the UnderworldExporter GitHub page links to, does it render the graphics with correct aspect ratio? I know Underworld Adventures certainly does. As a huge Ultima fan, I learned about this years ago. It's great to see old 3d games getting redone in Unity. Unfortunately, UU hasn't aged well despite being technologically innovative. Ultima VI and VII have aged much better in terms of fun. The developer also hasn't attempted to modernize the overly complex and cludgy interface, which gives it little advantage over using dosbox. What's most interesting to me is that he has a Terra Nova map viewer. Terra Nova is a fantastic game that would greatly benefit from res and viewing distance bumps the way Daggerfall does. Doesn't look like he has any plans for it, though. UW is the type of game that would benefit more from a remake/remaster than a port. It is a different beast to Daggerfall, which really pushed the boundaries and has clear improvements that DFUnity can provide. I don't think the same is really true for UW. @charlieg; I disagree! Every old game can benefit from some developer love and Unity is a capable platform that can unleash all the passion someone has for a certain game. I've never heard of this project before, thanks for posting about it. I loved UW2, and was quite disappointed when I eventually tried UW1 so wake me when it supports UW2. 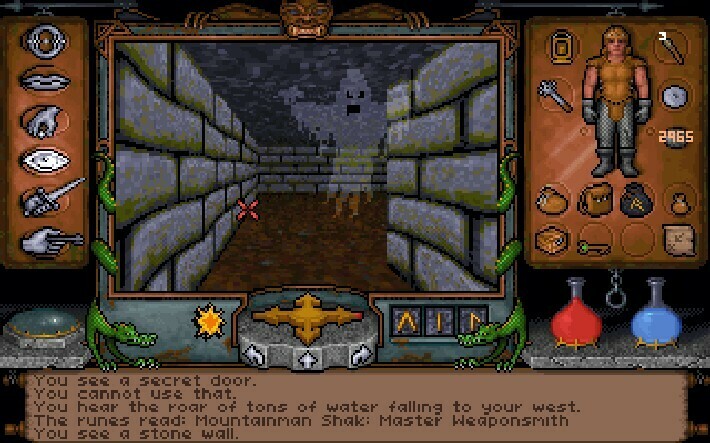 Ultima underworld 1 one of the best games for me. Dungeoncrawler with small, but actual world with dialogues, it's ecosystem, tons of characters and dialogues and other awesome things. Even maybe it not so directly plot connected, by spirit this is and great ultima game, and great game overall - something that influenced all FPS games and many ARPG games, including early tes games. Agreed I finished uw1 on dosbox few years back and it was smooooth from start to end. Strange enough, uw2 did not catch me so much. Maybe it was bigger and not so condensed, same as diablo2 was to diablo1? Ppl swear d2 is better than d1 but I love d1 more because its so exceptionally holding together, world is believable and tied together in one small yet epic piece. To me, less is more in many cases..